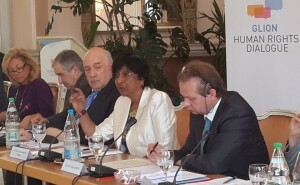 The Glion Human Rights Dialogue is an annual high-level retreat, hosted by the Governments of Norway and Switzerland, which brings together around sixty senior policy-makers and other stakeholders in an informal, non-attributable setting designed to promote open, forward-looking and solutions-focused debate. The Glion Human Rights Dialogue provides a platform for representatives of states, OHCHR, the wider UN, and other key parts of the human rights system such as Special Procedure mandate-holders, members of Treaty Bodies, and NGOs, to offer their assessment of the key challenges they face and their vision of how to best overcome them to strengthen the Council and the wider UN human rights system. The discussions are summarised in informal reports presenting some of the key messages, ideas and recommendations, which seek to encourage and contribute to wider consideration of the issues.